A huge story can set off alarm bells everywhere, but somehow, with ever increasing frequency, we note the silence of the mainstream media. Having avoided doing its job, it then protects its flank by denigrating those who call for inquiries. 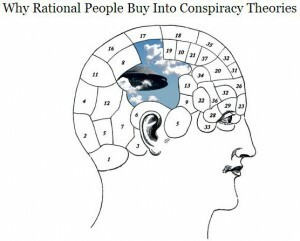 A recent example is this Times article : “Why Rational People Buy Into Conspiracy Theories.” It is illustrated with a Victorian diagram of the brain, updated to show the conspiracy theorist’s brain–with a flying saucer inside. The message is unmistakable: if you believe in any conspiracy (i.e., organized but deliberately hidden effort or operation) at all, you also believe in flying saucers carrying little green men. The article reinforces this implication. In the days following the bombings at the Boston Marathon, speculation online regarding the identity and motive of the unknown perpetrator or perpetrators was rampant. And once the Tsarnaev brothers were identified and the manhunt came to a close, the speculation didn’t cease. It took a new form. A sampling: Maybe the brothers Tsarnaev were just patsies, fall guys set up to take the heat for a mysterious Saudi with high-level connections; or maybe they were innocent, but instead of the Saudis, the actual bomber had acted on behalf of a rogue branch of our own government; or what if the Tsarnaevs were behind the attacks, but were secretly working for a larger organization? Crazy as these theories are….. The essay, by Times magazine columnist Maggie Koerth-Baker, implicitly suggests the public should immediately halt speculation once law enforcement officials “leak” information intended to shape our perceptions. No matter that these leaks are not the same thing as evidence presented at trial, that the leaks themselves serve an agenda, and that law enforcement has a long history of attempting to persuade the public of false narratives. No matter that the latter is a practice repeatedly, if often belatedly, chronicled by the Times itself. The author goes on to say that “recent scientific research” tells us that people who believe there’s more to a story may actually accept several competing theories as plausible. And because they are open to competing theories, they’re basically wacky. Such an ecumenical orientation to mysteries, akin to tolerating various conflicting religious faiths, is supposed to show that there’s something wrong with you. However, another study might find that those who prefer pat explanations from the authorities are equally irrational. For example, when the Tsarnaevs were first identified by the public from video footage released by the FBI, the Bureau told us the Tsarnaevs were previously unknown to it. Then the Bureau was forced by the Russians to admit it had known the brothers for quite some time. In fact, the Russians had briefed the Bureau on its concerns several years ago, and at that time, in response to the Russian information, the FBI had begun interacting with the Tsarnaev clan. This unexplained about-face was, according to establishmentarians, just fine. No questions, your honor. Here’s another doozy. We were initially told that MIT police officer Sean Collier was killed in an altercation April 18 with the Tsarnaevs—perhaps at a convenience store. Later, the authorities said Collier was actually assassinated completely unaware—shot point blank in the head while sitting in his patrol car—at an odd spot in between buildings on the MIT campus—and by unknown assailants. This switcheroo was also A-OK with outfits like The Times. Nothing to investigate, no reason to be suspicious. On April 19, the authorities told us that Dzhokhar Tsarnaev shot it out in a long gun battle with police before being apprehended. Later we learned, from the same authorities, that the young man, lying seriously wounded inside a boat parked in a suburban driveway, actually did not even have a gun with him. In fact, he was nearly executed in a totally one-sided gun battle. This fabulous flip-flop also raised no red flag with the establishment media. On May 22 the authorities told us the FBI had to kill Tsarnaev’s acquaintance in Orlando, Florida, Ibragim Todashev, because he lunged with a knife and stabbed an agent several times. Later, it emerged that, well, maybe he didn’t have a knife at all, but maybe at some time he brandished a broomstick, or, at article press time, something else. And that was OK too, by gosh, for the journalistic glitterati. Let’s face it: If a suspect in an interrogation room told this many contradictory stories, he or she would be locked up, and later probably prove eminently convictable by a jury. But a person who sees something sinister in such official confabulations gets lumped together with the people who see little green men from Mars floating in their soup. Anyone who has ever written for outfits like the Times knows that sucking up to authority will always serve one well professionally. Consider the eagerly establishment-pleasing Koerth-Baker, a “science editor” who scrupulously follows the journalism-school rules of the road: She dredges up the perennial “academic” so that it appears that her reporting has no agenda—she’s just sharing what some “expert” thinks. Since Hofstadter’s book was published, our access to information has vastly improved, which you would think would have helped minimize such wild speculation. But according to recent scientific research on the matter, it most likely only serves to make theories more convincing to the public. Perfectly sane minds possess an incredible capacity for developing narratives, and even some of the wildest conspiracy theories can be grounded in rational thinking, which makes them that much more pernicious. Consider this: 63 percent of registered American voters believe in at least one political conspiracy theory, according to a recent poll conducted by Fairleigh Dickinson University. Her assumption is that, in a country perennially employing tens of thousands of top-secret covert operatives, homicide-trained assassins and “special forces” enthusiasts, no one has any reason to suspect that any event involving some kind of death or mayhem was ever engineered on an organized basis. We are thus supposed to accept there is something essentially wrong with people who lose hope after seeing, time and time again, the most idealistic, reformist leaders inexplicably snuffed out, and their crusades dashed. This loss of hope and faith in a clearly dysfunctional system is seen as illness. And, by the way, that article in “The Psychologist” (for which she provides no link or citation) was only three pages long. On the other hand, there is no mention of what part of the brain causes some people to reflexively–if illogically–trust just about anything published in establishment media like the New York Times, The Atlantic, or stated on PBS. Even after they get so very many things wrong time and again. Koerth-Baker invokes the “backfire effect” to explain why conspiracy theorists are supposedly resistant to official narratives. But that effort actually, well, backfires. In 2006, the political scientists Brendan Nyhan and Jason Reifler identified a phenomenon called the ‘backfire effect.’ They showed that efforts to debunk inaccurate political information can leave people more convinced that false information is true than they would have been otherwise. “Nyhan isn’t sure why this happens, but it appears to be more prevalent when the bad information helps bolster a favored worldview or ideology. In that way, Swami says, the Internet and other media have helped perpetuate paranoia. Not only does more exposure to these alternative narratives help engender belief in conspiracies, he says, but the Internet’s tendency toward tribalism helps reinforce misguided beliefs. What worldview or ideology is held by Koerth-Baker and Swami? Is it bolstered by what they read in the New York Times? Koerth-Baker then quotes a historian at the University of California saying that conspiracies do exist. Don’t get too excited: she quickly supplies examples (Watergate, Iran Contra) where the conspirators were supposedly vanquished by an effective system in which the establishment media and Congress got to the bottom of things. In other words, don’t worry, everything is OK. The point is that the establishment will always be consistent. By definition, if the goal is to prevent the public’s waking up to the degraded state of democracy, then the only “real” conspiracies we will be encouraged to worry about will be propagandistic constructions designed to send us off in hopelessly wrong directions. Thus, allowing the Republican establishment to create hysteria around a “socialistic, secretly Muslim president,” while the president and almost all other top officials are in the thrall of a real conspiracy by financial interests to dominate our system. Or vilifying an entire religion as bent on destroying our way of life to the point that we must give up our civil liberties for the protection of the state. We recognize there is a kind of conspiracy fever in America, and that much of the speculation is groundless. But the authorities have brought this on with decades of deception, unnecessary secrecy, endless cover-ups and real crimes against the public interest. No wonder we can’t distinguish between plots on every corner and a skeptical attitude toward disturbing behavior from authority. The beauty of Koerth-Baker’s article, published in the Times magazine where supposedly well-educated people get their ideas before going forth to repeat them at dinner parties and on talk shows, is that it is itself inherently irrational—the stuff of editorial and intellectual fogheadedness. It take a very broad group of people who have little in common, and condemns them all, with the message that anyone who asks questions about official narratives should be considered delusional, albeit not necessarily clinically insane. The truth is, some people have been driven a bit, or more than a bit, crazy by repeated exposure to deeply disturbing real events (assassinations, mass murder, false-flag war-mongering), so that they begin to see a plot and a lie behind everything. This unfortunate strain of OTSD (On-going Traumatic Stress Disorder) is abetted by a substantial industry among radio, website and publishing personalities, who profit off the gullibility of their audiences by selling them bomb shelters and home canning equipment and other products of mass delusion. But there is another group, to which we proudly belong: people who live in the real world and are not blind to nuance, people who don’t buy what the kook machines have to sell, but also recognize that the establishment media (compromised by, among other things, its financial dependency on the corporate elites) can’t be trusted to get to the real bottom of things. To lump these different groups together and tar them all with the same brush amounts to a kind of willful journalistic malpractice. Along these lines, Koerth-Baker notes that ”Americans have always had the sneaking suspicion that somebody was out to get us — be it Freemasons, Catholics or communists.” No mention of the people that most people think are “out to get us” – members of the American aristocracy, without whom the New York Times would not even exist. In order to understand who is a crazy conspiracy theorist, you first have to understand which theories are crazy, and which are valid—and that requires a knowledge of current events and history apparently beyond the ken of the likes of Koerth-Baker. Without such knowledge, you’re in no position to assess whether a perceived conspiracy might be real or not. Example: if you don’t know that John Wilkes Booth had accomplices in the death of Abraham Lincoln, you would judge as bonkers a statement that at least one American president was in fact killed by a conspiracy. It is not clear whether Koerth-Baker is truly ignorant of these issues—or just wants to help the New York Times keep you ignorant. In any case, when it comes to understanding how the powerful stay powerful, we clearly need fewer critiques of members of the public who ask questions—and a lot more studies of the facts themselves. There are 137 comments Our Comment Policy: Keep it civilized, keep it relevant, keep it clear, keep it short. Please do not post links or promotional material. We reserve the right to edit and to delete comments where necessary.